With a busy market, a club, a museum and a contest hall(a battle tent for Emerald players), there's a lot to see and do. You still have to deliver the Devon goods, so go to the shipyard to look for Stern. The shipyard is where new ships are built and old ships are sunk. Stern isn't around and the man reading the blueprints will confirm this. With nothing else to do, head outside and north to the Oceanic Museum. 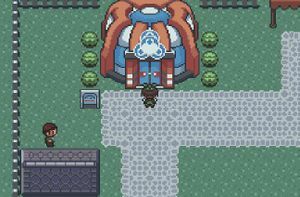 When you first arrived, you might've noticed the long line of Magma/Aqua grunts waiting outside, blocking the entrance. Once you've spoken to the man at the shipyard, the line will clear and you can finally enter. The admission fee is 50, though if you have less than that the receptionist will think you are a grunt and let you enter for free. You'll immediately notice Team Magma/Aqua grunts all over the museum, and the first one you meet is the same grunt you battled before! He'll give you TM46 (Thief) so that you'll leave him alone. Thief is an interesting Dark Type move that let's you steal the opposing Pokemon's held items, but it's a pretty weak move. Walk upstairs and you will meet Capt. Stern. After finally giving him the Devon goods you'll be confronted by two grunts who'll challenge you to a battle. Once you defeat the grunts their leader will show up. After warning you not to meddle in their business any further, they will leave. Upon exiting the museum, Scott will show up and ask to be added on your PokéNav. He explains that he wants to keep an eye on the talents of other trainers as well, so he'll be roaming other towns more. He then leaves. The Name Rater lives in a house in below the Contest Hall/Battle Tent. He will offer to rename your Pokemon, unless it's obtained from trading. The Slateport Market contains myriad items that are not found in a typical Poké Mart, so it's well worth your time to visit. The doll vendor sells dolls that you can use to decorate your room or secret base. This vendor only appears after you've received TM43 (Secret Power) from one of their members on Route 111. The Energy Guru's items might be pricey, but they're very useful. Each item permanently increases your Pokemon's stats. Also, the woman to his left will give you an Effort Ribbon if your main Pokemon doesn't already have a ribbon and had accumulated 510 effort values. This vendor will only sell you items after you've received TM43 (Secret Power) from one of their members on Route 111. 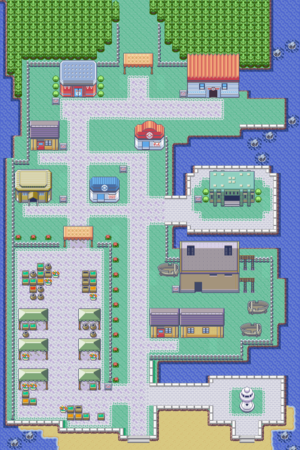 At the northwest part of Slateport in Ruby and Sapphire is the Hyper Rank Contest Hall. Your Pokemon aren't egligible to enter this contest just yet, but you can get some items here. Talk to the girl and she will give you a Pokeblock Case, which let's you store Pokeblocks that you can make with berries using machines in the Contest Hall. A sailor near the stage will give you TM41 (Torment) for listening to him. It prevents a Pokemon from using the same move twice, and can be pretty devastating for Pokemon with only one or two damaging moves. As for entering the Pokemon Contest here, you can only do that if the pokemon you're entering has beaten the Super Rank Pokemon Contest in Fallarbor, which is still quite far away. For Emerald players, the Contest Hall is replaced by the Battle Tent. There is also a sailor there that will give you TM41, so be sure to talk to him. Battle Tents always contain some kind of gimmick that is used in the Battle Frontier accessible only after you defeat the Pokemon League. Battling here gives you no experience or money, though you do receive a prize if you complete the challenge. The gimmick of this Battle Tent is that you can't use your own Pokemon. You have to select 3 Pokemon from a random selection of 6, all at level 30. You can check their summaries to know their stats and moves, and it's advised that you do that. Once you've selected your Pokemon, you'll battle against 3 trainers using random Pokemon. After each battle you can choose to trade a Pokemon with the other trainer, though you can't see their summaries and have to deduce their movesets from observing them in battle. There's not much of a strategy to help you beat this Battle Tent. Just choose a Pokemon with a good moveset for your team and hope you don't get put at a type disadvantage against the opponent's Pokemon. You get a Full Heal for beating the challenge, which let's you heal any status afflictions on one Pokemon. It's a very good item, so it might be worth it to take the challenge multiple times. If you've already cleared Team Aqua/Magma out of the Museum, you'll run into Scott again. He doesn't say anything important, he just encourages you to defeat the battle tent and to "Give it your best effort!". This page was last edited on 28 January 2019, at 00:11. This page has been accessed 302,197 times.